A key feature of organic farming systems is the utilization of organic residues as soil mulches and amendments in an integrated system to maintain and improve soil quality. Organic residues used for these purposes may be produced on the farm, or they may be imported from off-farm sources. Often, fresh organic residues produced in place are used in these practices, such as when cover crops are plowed down as a green manure to build soil organic matter and improve soil fertility, or rolled as a mulch in organic no-till systems to suppress weeds, reduce soil erosion, and conserve soil moisture. Organic residues may also be processed before being used to attain desirable qualities, such as when animal manures are composted to reduce volume and improve stability. Regardless of the circumstances, organic residues that are handled incorrectly can introduce otherwise avoidable problems to the farming system. For example, raw cattle manure may contain viable weed seeds and may spread an otherwise isolated weed infestation more broadly across the farm or, if the manure is imported from outside the farm, introduce a weed problem that previously didn't exist. Similarly, plant residues may be infected with pathogens that can infest subsequent crops. This article provides a brief description of the composting process, discusses the use of composting to reduce weed seeds and plant pathogens, and identifies issues that can lead to the failure of composting to reduce weed seeds and plant pathogens. "The product of a managed process through which microorganisms break down plant and animal materials into more available forms suitable for application to the soil. Compost must be produced through a process that combines plant and animal materials with an initial C:N ratio of between 25:1 and 40:1. Producers using an in-vessel or static aerated pile system must maintain the composting materials at a temperature between 131 °F and 170 °F for 3 days. Producers using a windrow system must maintain the composting materials at a temperature between 131 °F and 170 °F for 15 days, during which time, the materials must be turned a minimum of five times." Under these conditions, populations of microorganisms will thrive and organic residues will be decomposed, consuming oxygen and releasing intermediate breakdown products, carbon dioxide, and heat. As the temperature of the pile rises, the community of microorganisms will go through a succession, culminating in thermophilic (heat-loving) organisms at temperatures above 113 °F (45 °C). If the mass of the compost pile is large enough to be self-insulating, temperatures within the pile during this active phase of composting may reach 131–170 °F (~55–70 °C) within 1–3 days. To maintain biological activity and to bring the active phase to completion, temperatures should be monitored and compost moisture and aeration should be maintained. After the most readily decomposable organic matter in the compost is consumed, biological activity will decrease in intensity, and temperatures and oxygen consumption will decline. The compost then enters the curing phase, during which decomposition proceeds more slowly and organic matter is converted to stable humic substances—the finished or mature compost. See the related article, Making and Using Compost in Organic Agriculture, for more information about composting. How does composting reduce weed seeds? Several factors contribute to weed seed mortality during composting. In compost systems assembled and managed in accordance with requirements for organic certification, the most important factors are the interaction between weed species, temperature, time, and moisture (Eggley, 1990; Shiralipour and Mcconnell, 1991; Eghball and Lesoing, 2000; Larney and Blackshaw, 2003; Dahlquist et al., 2007). In general, the higher the temperature to which weed seeds are exposed during the active phase of composting, the higher the weed seed mortality. Similarly, the longer the duration of high-temperature exposure, the higher the weed seed mortality. Thus, Dahlquist et al. (2007) estimated that three of the six weed species they examined under controlled laboratory conditions were unaffected by temperatures of 108 °F, but 90% of the seeds of all six species were killed after less than three hours at 140 °F (Table 1). Furthermore, all six species suffered 100% mortality after less than an hour at 158 °F. Similarly, in Texas, Weise et al. (1998) found that, in composting manure at 35% moisture, barnyardgrass, pigweeds, and kochia seeds were killed after three days at 120 °F; Johnsongrass seed was killed with three or more days of exposure at 160 °F; but field bindweed seeds were killed only after seven days at 180 °F. Table 1. Estimated number of hours required to kill 90% of seeds (after Dahlquist et al., 2007). Susceptibility of weed seeds to thermal mortality, however, is influenced by the moisture content of the compost; weed seeds in a dry environment are able to survive higher temperatures for longer times than seeds in a moist environment. Some (Egley, 1990; Thompson et al., 1997) have suggested that thermal mortality may be greatest for fully imbibed seeds—seeds that have absorbed water and split their seed coat in the process of germination. In Nebraska, Eghball and Lesoing (2000) showed that adding water to beef manure compost greatly enhanced weed seed destruction; moist compost was faster and more effective at killing cocklebur, morningglory, pigweed, sunflower, velvetleaf, foxtail, smooth brome, and shattercane than dry compost, in part due to higher compost temperatures. Other factors are thought to contribute to weed seed mortality during composting. Larney and Blackshaw (2003) observed considerable variability in the relationship between temperature exposure in windrows and seed viability for a number of weeds, and concluded that additional factors, such as germination into lethal conditions or pathogen infestation, were contributing to weed seed mortality. Others have implicated plant-toxic compounds that accumulate to sufficiently high concentrations during composting (phenols, ammonium, and acetic acid, for example) in weed seed mortality and suppression of germination (Eghball and Lesoing, 2000; Shiralipour and Mcconnell, 1991). How does composting reduce plant pathogens? Of all these factors, heat generated during the active phase of the composting process appears to be the most important in pathogen destruction. Bollen et al. (1998) found that only two of 17 plant pathogens investigated—Olpidium brassicae and one form of Fusarium oxysporum—survived when exposed to small-scale static pile composting of infected plant residues, and then only at greatly reduced levels. Thermal mortality during the active phase of composting was found to be the most important factor affecting pathogen destruction. In California, Downer et al. (2008) found that unturned piles of fresh and aged green waste (note that these piles would not have satisfied organic certification requirements) did not uniformly expose pathogens to lethal temperatures. They recommended that green waste stockpiles should be turned intermittently to mix pile contents and move propagules to a part of the pile where they would be more likely to be killed by heat, microbial attack, or chemical degradation that occurs during active aerobic composting. In general, adherence to a composting process that meets the requirements of organic certification should result in substantial—if not complete—destruction of weed seeds and plant pathogens. Incomplete composting, on the other hand, can result in the survival of weed seeds and/or plant pathogens. Too high a C:N ratio of initial ingredients, too little water, or too little oxygen can inhibit the rate of decomposition, and thus the production of heat. Too much water can starve the pile of oxygen and result in anaerobic decomposition. Accumulation of toxic products may inhibit fungal and microbial activity, thus slowing the rate of decomposition. Too small a pile or windrow may loose heat too quickly to reach adequate temperatures, whereas too large a pile may have inadequate aeration to support aerobic decomposition. To avoid these problems, assemble raw materials carefully to achieve the proper starting conditions of C:N, moisture, pile porosity, and size; monitor temperature and moisture conditions; and turn/aerate as needed to maintain a biologically active, aerobic environment. Excellent resources providing detailed instructions and guidelines for composting include The Art and Science of Composting (Cooperband, 2002), Composting on Organic Farms (Baldwin and Greenfield, 2009), and On-Farm Composting Handbook (Rynk, 1992). Temperatures at the edges and surface of compost piles and windrows may not be sufficient to kill weed seeds and pathogens. This is an especially important risk in static piles that are not turned and mixed during the active phase of decomposition, but rely on forced aeration to maintain an aerobic environment. Thorough mixing or turning during the active phase is essential to ensure that all the material achieves elevated temperatures for a long enough period of time to kill weed seeds and pathogens. Dry heat is less effective than moist heat at killing weed seeds. Ensure that moisture content of the pile or windrow is maintained at 40–60%. Contamination with soil or uncomposted residues, especially after the active phase of composting has finished, can lead to the reintroduction of weed seeds or plant pathogens. Avoid adding fresh material after the active phase. Finished compost can become recontaminated with weed seeds if weeds are allowed to grow and go to seed on or adjacent to the pile or windrow. Similarly, compost can become contaminated with vegetative reproductive structures from some weeds—Canada thistle and rhizomateous grasses, for example—if they are allowed to grow on or adjacent to the pile. Keep vegetation adjacent to stored compost mowed short, and tarp piles or windrows to prevent contamination by wind-blown weed seeds. When moving or spreading finished compost, avoid picking up soil or other contaminants from under or around the pile or windrow. Baldwin, K. R., and J. T. Greenfield. 2009. Composting on organic farms. Organic Production Publication Series, Center for Environmental Farming Systems. North Carolina Cooperative Extension Service, Raleigh. (Available online at: http://www.cefs.ncsu.edu/resources/organicproductionguide/compostingfinaljan2009.pdf) (verified 20 March 2010). Bollen, G. J. , D. Volker, and A. P. Wijnen. 1989. Inactivation of soil-borne plant pathogens during small-scale composting of crop residues. Netherlands Journal of Plant Pathology 95 (Supp 1): 19–30. Cooperband, L. 2002. The art and science of composting. Center for Integrated Agricultural Systems, University of Wisconsin, Madison. (Available online at: http://www.cias.wisc.edu/wp-content/uploads/2008/07/artofcompost.pdf) (verified 20 March 2010). Dahlquist, R. M., T. S. Prather, and J. J. Stapleton. 2007. Time and temperature requirements for weed seed thermal death. Weed Science 55:619–625. (Available online at: http://dx.doi.org/10.1614/WS-04-178.1) (verified 17 Nov 2009). Downer, A. J., Crohn, D., Faber, B., Daugovish, O., Becker, J. O., Menge, J. A., and Mochizuki, M. J. 2008. Survival of plant pathogens in static piles of ground green waste. Phytopathology 98:547–554. (Available online at: http://dx.doi.org/10.1094/PHYTO-98-5-0547) (verified 29 June 2010). Eghball, B, and G. W. Lesoing. 2000. Viability of weed seeds following manure windrow composting. Compost Science & Utilization 8:46–53. Egley, G. H. 1990. High-temperature effects on germination and survival of weed seeds in soil. Weed Science 38:429–435. Larney, F. J., and R. E. Blackshaw. 2003. Weed seed viability in composted beef cattle feedlot manure. Journal of Environmental Quality 32:1105–1113. (Available online at: http://dx.doi.org/10.2134/jeq2003.1105) (verified 17 Nov 2009). Noble, R., and S. J. Roberts 2004. Eradication of plant pathogens and nematodes during composting: A review. Plant Pathology 53:548–568. (Available online at: http://dx.doi.org/10.1111/j.0032-0862.2004.01059.x) (verified 29 June 2010). Rynk, R. 1992. On-farm composting handbook. Natural Resource, Agriculture, and Engineering Service, Ithaca, NY. (Partially available online at: http://compost.css.cornell.edu/OnFarmHandbook/onfarm_TOC.html) (verified 20 March 2010). Shiralipour, A., and D. B. Mcconnell. 1991. Effects of compost heat and phytotoxins on germination of certain Florida weed seeds. Soil and Crop Science Society of Florida Proceedings 50:154–157. Thompson, A. J., N. E. Jones, and A. M. Blair. 1997. The effect of temperature on viability of imbibed weed seeds. Annals of Applied Biology 130:123–134. (Available online at: http://dx.doi.org/10.1111/j.1744-7348.1997.tb05788.x) (verified 17 Nov 2009). United States Department of Agriculture. 2000. National organic program: Final rule. Codified at 7 C.F.R., part 205. (Available online at: http://www.ecfr.gov/cgi-bin/text-idx?c=ecfr&sid=3f34f4c22f9aa8e6d9864cc2683cea02&tpl=/ecfrbrowse/Title07/7cfr205_main_02.tpl) (verified 14 June 2010). Wiese, A. F., J. M. Sweeten, B. W. Bean, C. D. Salisbury, and E. W. Chenault. 1998. High temperature composting of cattle feedlot manure kills weed seed. Applied Engineering in Agriculture. 14:377–380. 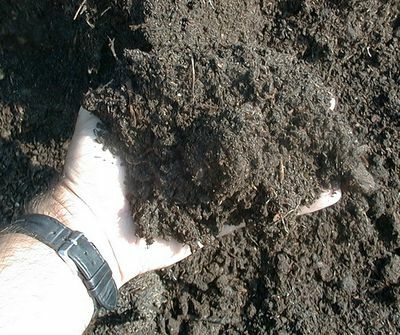 (Available online at: http://amarillo.tamu.edu/files/2010/11/bean6_High-Temperature-Composting.pdf) (verified 29 June 2010). Composting | Reduce, Reuse, Recycle | US EPA [Online]. U.S. Environmental Protection Agency. Available at: http://www2.epa.gov/recycle/composting-home (verified 29 Jan 2010). Composting. WSU - Center for Sustaining Agriculture and Natural Resources [Online]. Board of Regents, Washington State University. Available at: http://csanr.wsu.edu/pages/BIOAg_Compost (verified 29 August 2011). Cornell Composting. Cornell Waste Management Institute [Online]. Cornell University. Available at: http://compost.css.cornell.edu/ (verified 16 Dec 2009). LeaMaster, B., J. R. Hollyer, and J. L. Sullivan. 1998. Composting animal manures: Precautions and processing. University of Hawaii, College of Tropical Agriculture and Human Resources. Available online at: http://www.ctahr.hawaii.edu/oc/freepubs/pdf/AWM-1.pdf (verified 24 Nov 2009). US Composting Council [Online]. US Composting Council. Available at: http://www.compostingcouncil.org/ (verified 16 Dec 2009).